After bringing you an exclusive first look at Ahri Lehman (Friday the 13th) in the indie Halloween horror film The Barn, we now have a brand new, appropriately retro-styled trailer for the ’80s throwback, which is set on Halloween night in 1989. The new trailer introduces us to the film’s trio of evil trick-or-treaters, known as Hallowed Jack, Candycorn Scarecrow, and The Boogeyman. Read on for the full press release and then check out the second official trailer for The Barn in the player below, and tell us what you think in the comments! 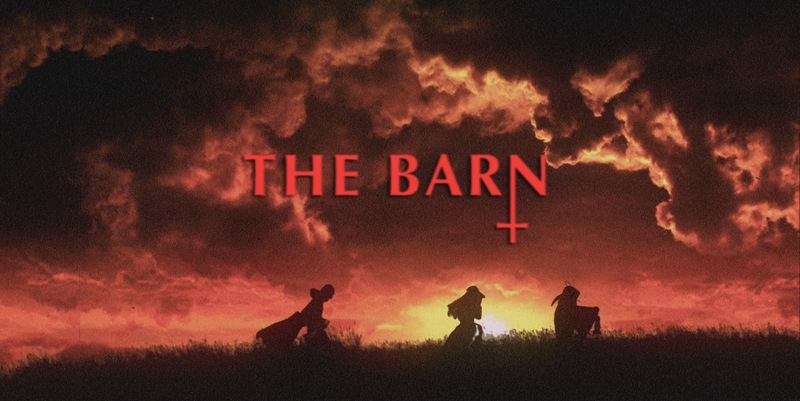 From writer director Justin M. Seaman, THE BARN is a new film created to give fans of 1980s horror a bloody good time. An Indiegogo campaign for finishing costs is currently underway (ending August16, 2015), offering contributors many fun retro perks for backing the project. You can click here to contribute. The film’s second trailer has also been released this week introducing the film’s main baddies – Hallowed Jack, The Candycorn Scarecrow and The Boogeyman. On Halloween night in 1989, best friends Sam and Josh are trying to enjoy what’s left of their final All Hallow’s Eve before graduating high school. However, diabolical trouble arises when they and their friends take a detour on the way to a rock concert. After finding an old abandoned barn and awakening the evil inside, it’s up to Sam and Josh to find a way to protect the group by defeating the demonic creatures that lurk within THE BARN. The film stars Mitchell Musolino, Will Stout, Lexi Dripps, Cortland Woodard, Nikki Darling, Nickolaus Joshua and Ari Lehman (the first Jason Voorhees from ‘Friday the 13th’). Nevermore Production Films has gained attention through its successful series of promotional avenues, such as the retro-style poster by Sadist Art Design’s Marc Schoenbach, an original film score provided by Rocky Gray (former member of the Grammy award-winning rock band Evanescence), and the contributions of Screen Junkies’ Honest Trailers’, Jon Bailey, who provides the voice-over track for both official trailers. Additionally, the film’s 1980’s style marketing merchandise consists of a Big Box VHS, action figures, T-shirts, a motion picture soundtrack on vinyl/cassette/cd, NES style 8 bit videogame, and a board game with art provided by Horror Hound/Scream Factory artist Nathan Thomas Milliner. THE BARN is scheduled to premiere in Pittsburgh in October of 2015 if the Indiegogo campaign is successful.